I got a little aggressive with the print mixing yesterday when I wore this outfit! But I love it. 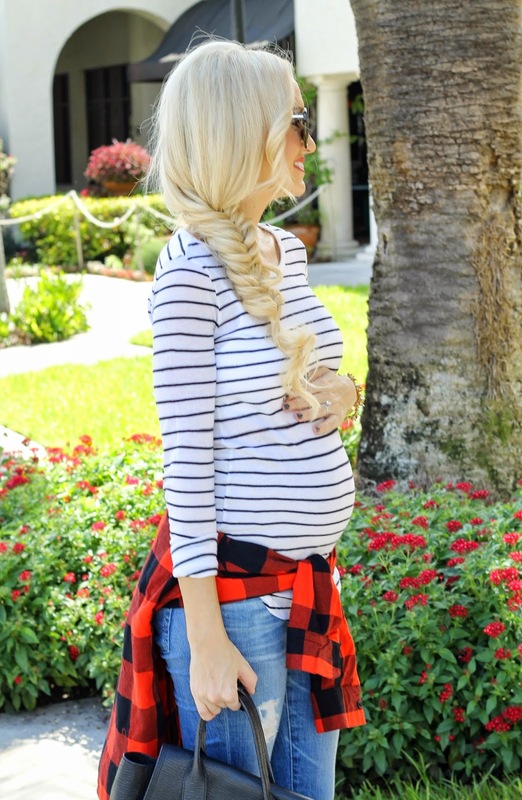 This striped tee has been a staple through my pregnancy, even though it is not maternity! It runs on the long size. I am wearing a extra small. I have also been really loving all of the Fall clothes that I have been finding at old navy. They are super cute and so inexpensive. Which is a plus for me because living in Florida I don't like spending tons of money on Fall and Winter clothes. I am so excited it is finally October! I think it is one of my favorite months. Thanks for stopping by. You've mixed three great prints together! Love this outfit! Adorable fall outfit. Love the mix of prints! I love stripes! Mixing with the plan and adding those gorgeous shoes makes for a wonderful fall outfit! Perfection! Literally all of my favorite prints & styles in one post. I adore your distressed denim, especially during this wacky transitional weather. I am also so obsessed with stripes that when I saw you wearing a striped shirt, I was already in love, but you perfected this look by adding plaid and leopard. So gorgeous Jade & you styled it to perfection! This is the perfect fall outfit and it love how you dressed it up with heels! Flawless print mixing! I love your pattern mixing here! That buffalo plaid top tied around your waist is the perfect addition!! I love your leopard pumps! I think I say that every time you wear them but they really are gorgeous! love love love that plaid shirt and how you've styled it. this whole outfit is perfect for fall! I love all the print mixing, it's so chic! You look so cute pregnant! Your little bump is growing so quickly! perfect outfit! obsessed with those shoes! super cute! love the braid! !